During the 2010 World Cup, the name of Vincent Aboubakar made the headlines for the then 18 year old was the only member of the Cameroon squad who plied his trade domestically. A move from Cotonsport to Valenciennes had already been finalised but a stop and start three-season tenure at Valenciennes was filled an imcompatible mixture of magnificence and mediocrity. 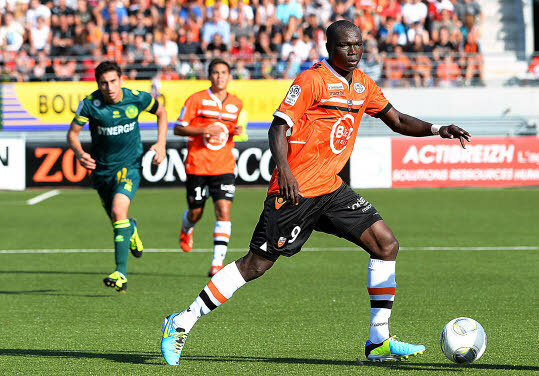 Still only 21, the Cameroonian’s summer move to Lorient seems to have rejuvenated him however; he already boasts 3 goals in 6 games, including one against his former employers Valenciennes. With a penchant for loitering deep and increasingly becoming assured with his back to goal, he linked up brilliantly with Sadio Diallo and Kevin Monnet-Paquet in last weekend’s thoroughly entertaining 3-3 draw versus Girondins de Bordeaux.